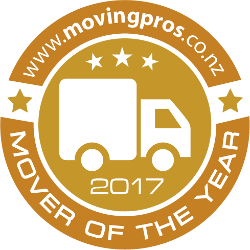 The Mover of the Year Awards recognises the best movers on MovingPros from across New Zealand, based on verified customer reviews. Helping them to stand out, generate more exposure and win more business. We provide the following exclusive benefits to movers who achieve a Mover of the Year Award. A special Mover of the Year award will be added to your profile to help you stand out and win more business. A Mover of the Year badge will be unlocked for you to use for promotion on your site and social pages. More exposure by being featured on the MovingPros awards page, within social media and media releases. How to Qualify for the Awards? Movers who meet the following criteria are automatically entered into the Mover of the Year Awards. Registered members quoting on moving requests every month. Have a minimum of 10 verified reviews on your profile. Have a minimum 4/5 star customer rating on your profile. Answers to our 'Mover of the Year Awards' common questions. The key to winning a Mover of the Year award is to continue to get reviews from your moving customers. Make it a habit to ask them to review you on MovingPros. The best movers aren't necessarily the ones that do the most moves. The best movers are the ones that get great feedback from their customers. What is the submission deadline for the 2017 awards? Movers have until 12pm midnight on the 30th November 2017 to request and receive reviews from their moving customers. Reviews submitted after this date will not be valid for the 2017 awards criteria. Only verified reviews will be counted towards winning a title. The winners will be announced in December 2017 and notified individually as well as being promoted on our website, through social media and a press release sent out to the media.